In most years, there is a window of only 10 – 14 days in which fruit thinning can be done successfully. 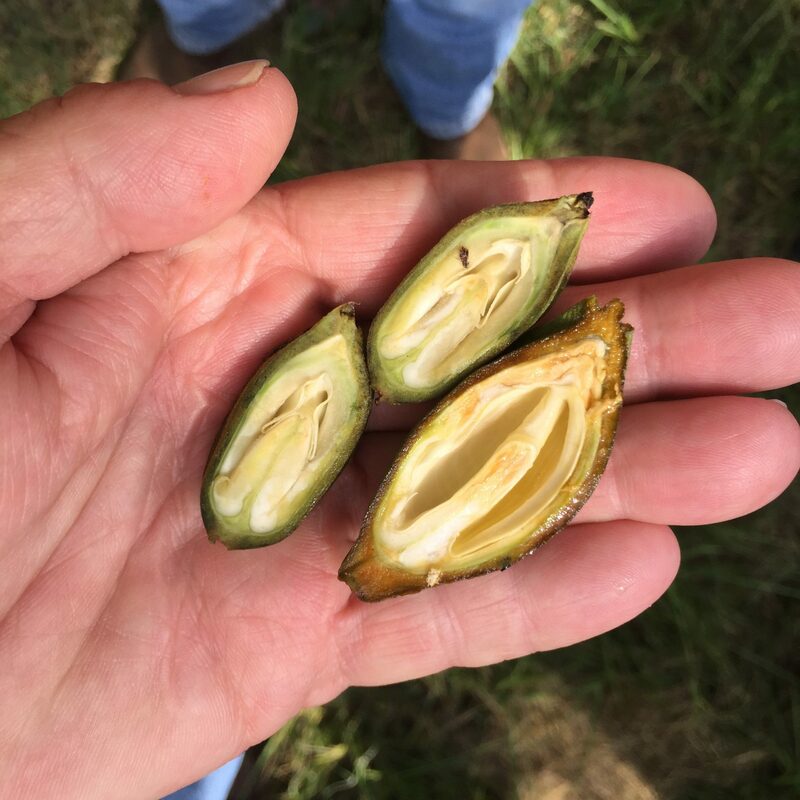 Research has shown that… nuts should be removed when the ovule (cavity inside nut in photo below) is 50% to 100% expanded, but before the kernel enters the dough stage. Thus, the calendar date for fruit thinning of pecan will vary with cultivar and location, as well as from year to year. After the female flower has been pollinated and fertilized, the ovule (the tissue that becomes the kernel) begins to expand and lengthen from the tip of the nut toward the stem. As the ovule expands, the space inside is filled with a watery substance called liquid endosperm. After the ovule extends to the stem end of the nut, and the nut reaches full size, the shell begins to harden from the tip backward. When the ovule is completely expanded, the kernel begins to fill and nuts pass from the water stage to the gel stage, to the dough stage. Ovule (cavity) on the right is 70-80% expanded where left cavity is just starting. The amount of nuts to remove varies with nut size, cultivar, crop load, and environmental factors. Judging the tree’s crop load is another important factor in the decision to thin. This is a practice that takes experience. The percentage of nut-bearing terminals can be developed by observing the number of fruiting terminals counted from an observation of 50-100 random terminals on a tree. Trees with almost 100% of the shoots bearing fruit and a cluster size greater than three are overloaded and should benefit from thinning. Optimum crop load varies with cultivar and may range from 50-70% fruiting shoots. 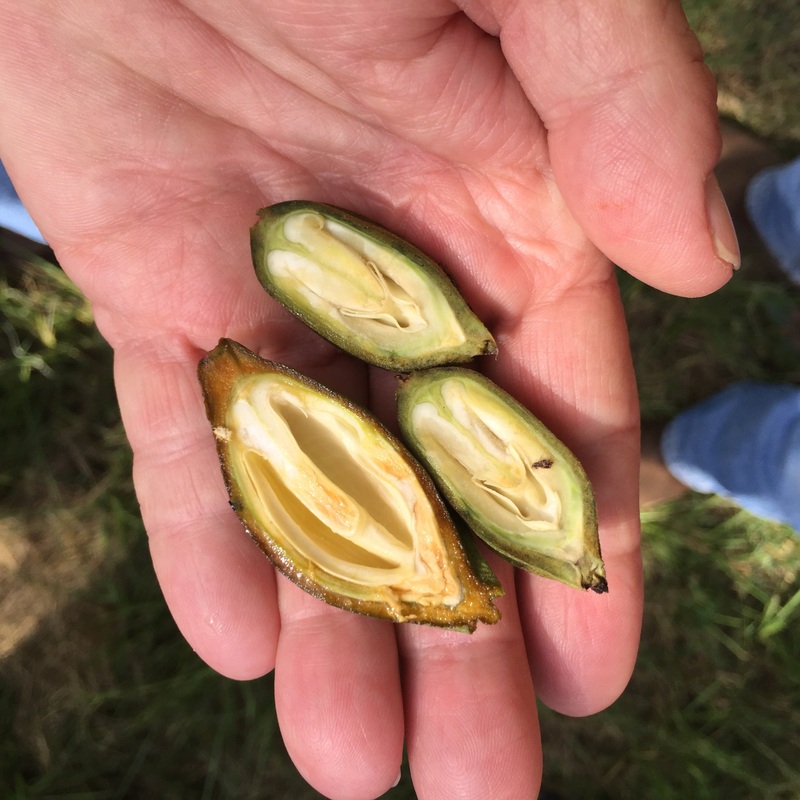 Varieties with small nut size can be thinned more lightly than those with large nut size. For example, optimum crop load on cultivars greater than 70 nuts per pound may be 60-70% fruiting shoots. Nuts in the size range of 50-70 nuts per pound, like Cape Fear or Stuart, have an optimum crop load of 50-60% fruiting shoots. While varieties with large nut size of less than 50 nuts per lb may have an optimum crop load of only 45-50% fruiting shoots. The major mistake growers make when first time attempting to fruit thin is not removing enough nuts. When shaking begins, don’t be alarmed by the number of nuts that fall. Trees should be shaken two to three seconds at a time, evaluated, and then shaken again if needed. This process should be repeated until the operator has a feel for how hard to shake to achieve the desired results. Increased profit potential through enhanced size, quality, and return crop has so far been shown with mechanical fruit thinning on Cape Fear, Creek, Pawnee, Schley, Stuart, Sumner, Kiowa, Cheyenne, Shoshoni, and Mohawk. This does not mean that the practice is not profitable on other cultivars, but simply that it has not been adequately tested for those cultivars not mentioned. It is likely that most pecans with fruiting characteristics similar to those previously mentioned would respond favorably.